She is very watchful and observant, spending most of her time attending to her surroundings. She isn't suspicious of others and will quickly rush up to greet another feline and with ease. She tends to be quite playful, especially when there is something or someone to play with. She overreacts to everything, especially the change in an environment. She moves in a confident manner, well coordinated and relaxed manner. She shows very little fear to others. She learns quickly and appears to also have a long term memory. She tends to seek out or investigate new situations or even things she found on a walk. She is very willing to be compliant and is quick to do something when someone asks her to. This feline has soft, dense fur which only grows thicker during the fall and winter months. She has a ivory canvas with black dots and rosettes placed in various areas around the female's bodice. She has a long, thick banner to help Kagami keep her balance, it's also used to shield her from the cold at night. She has rounded, short auditories to reduce the heat loss when in cold climates and a short and wide nasal cavity which heats the air taken in before it reaches her lungs. Her extra large paws help her from sinking deep into the snow. Her large paws keeps her from sinking in the snow. Her auditories are short and rounded to reduce the heat loss and wide, short naval cavity which heats up the air before it reaches her lungs. 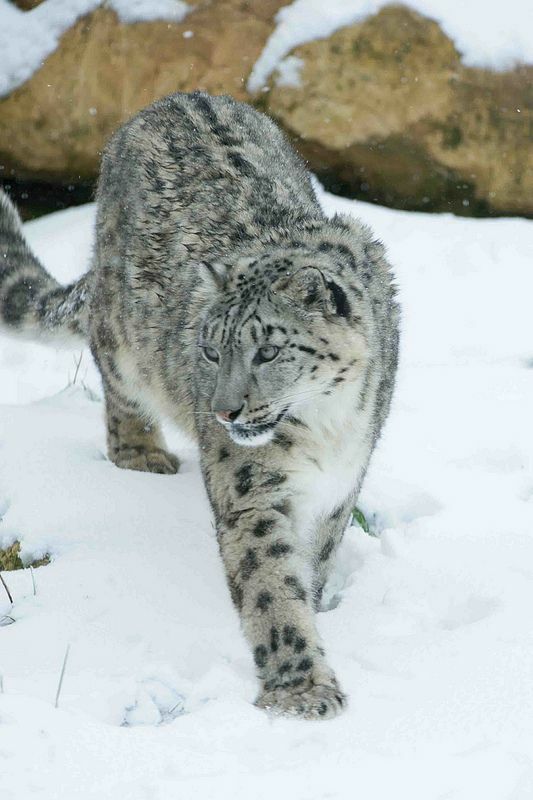 Her pelt is long to keep her warm and a long tail which helps her keep her balance. When she's out somewhere hot, her fur tends to make matters worse. Also, in some cases she can be a bit clumsy with her large foundations. Kagami hasn't taken a liking into anyone. Both of her parents, Alai and Fawn are deceased along with her two siblings, Raven and Hachio.